I try to eat healthy, most of the time, but there is one food I just can’t resist. Pizza. I know I am not alone in this either. If I could afford it I would only eat pizza in a restaurant with a proper pizza oven, as there really is nothing that comes close to that taste. But, it is just too expensive to do very often. Takeaway pizza is the same. Unless you can find a really good deal and plenty of friends to share the pizza, and the cost, then it is certainly an expensive treat. Sadly, frozen pizza or fresh ones from the supermarket are my usual pizza fix and they are just not the same. I have been looking at making my own pizza from scratch. And, it turns out that with a little bit of planning and careful practice making pizza dough and even the sauce from scratch isn’t nearly as difficult as I first thought. This is great! But, sadly I still have a problem with soggy bottoms! Which is why I embarked on my search for the perfect pizza cooking solution. I ordered the pizza grilling stone set with peel and pizza cutter from UK Fine foods. It is currently priced at £23.99 (normally it would be £29.99). I think that’s a really good price for all three items and UK delivery is free. So, in total, a similar amount to what you would probably spend on takeaway pizza for a couple of people. The set includes a pizza stone. This is 38 centimetres in diameter, and is made of porcelain composite. This means you can pop it in the oven and get it really hot before you put the pizza on it. This is the key to avoiding a soggy bottom (I really can’t say that without thinking of Mary Berry by the way). It heats up as you heat the oven. And, once they are both to temperature, you can put your pizza on it and cook. The Peel is a stainless-steel paddle with a wooden handle that can be removed. It’s made to a traditional design. 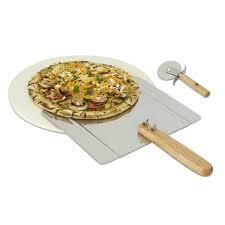 It’s perfect for transferring your uncooked pizza to the very hot pizza stone without burning your hands. It’s also great for removing it from the stone after it has cooked. There is even a useful pizza cutter in the set to help you cut perfect slices with ease. I am a complete convert now to the idea of making pizza at home. The pizza stone was a fantastic find, I get great tasting crispy pizza every time for a fraction of the price I was paying before. I can, of course, put whatever topping I fancy on it, no matter how unusual the combination, without anyone looking at me oddly! If like me you love your pizza then this is well worth the money. You can use it in your normal oven, or on a BBQ. Or, if you are lucky enough to have a pizza oven then it will work perfectly in there as well.